UVA's President Jim Ryan is running the Boston Marathon and dedicating it to teachers at the Curry School of Education. CHARLOTTESVILLE, Va. (WVIR) - University of Virginia President Jim Ryan ran the Boston Marathon for the ninth time on Monday morning while honoring teachers. Ryan dedicated his run in honor of teachers in the Curry School of Education. It is a tradition he started while dean of the Harvard Graduate School of Education. Ryan completed the 26.2 mile race in 3:21:57 with the names of 26 teachers on the back of his singlet. Teachers from the university&apos;s Curry School of Education nominated each of those teachers to give thanks to some of their mentors. Ryan is dedicating his race to 26 teachers in UVA&apos;s Curry School of Education. University of Virginia President Jim Ryan is on the run again – this time, in honor of teachers. Monday – “Patriots&apos; Day” in Massachusetts – brings the 121st annual Boston Marathon, and Ryan will run the race for the ninth time. Continuing a tradition he started as dean of the Harvard Graduate School of Education, Ryan will dedicate his run to beloved educators. 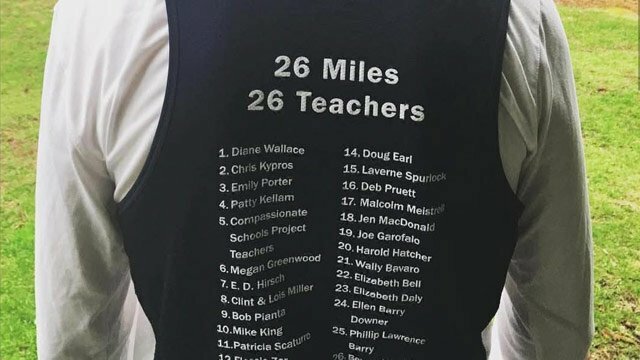 On Monday, Ryan will hit the pavement with the names of 26 teachers – one for each mile – adorning the back of his T-shirt. Each of the 26 names was submitted by a donor to UVA’s Curry School of Education and Human Development. Along with a $260 donation, donors had the opportunity to name an educator who made a difference in their lives. Robert Pianta, dean of the Curry School, nominated his former teacher, Bernard Kenyon. An avid distance runner, Ryan has used his love of the sport to build bridges and bring people together throughout the UVA and Charlottesville communities. His inauguration weekend in October included the Community Bridges 5k fundraiser, and he ran last year’s Richmond Marathon in support of Madison House, the independent, nonprofit volunteer center for UVA students. He’s also taken to hosting regular morning runs around Grounds – followed by bagels on the steps of Madison Hall. Most recently, Ryan strapped on his running shoes to run with about 130 members of the UVA community in Minneapolis, hours before the Cavalier basketball team won its first national championship, downing Texas Tech, 85-77, in a thrilling overtime duel. You can follow along on Monday through Ryan’s Twitter and Instagram accounts. To support Ryan’s run and to view the full list of teachers who were nominated, click here.